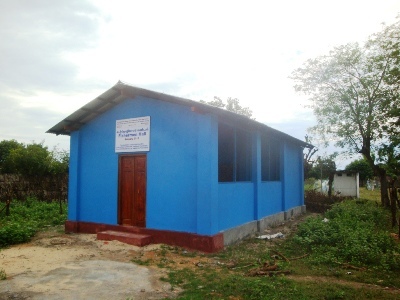 A small meeting/utility building for the Melinchimunai Fishermen’s Cooperative Society, 30’ x 15’ in dimension – to be used by the members for their meetings and for business purposes. The crab nets were delivered in August 2012 to 232 fisher families, who are members of the Melinchimunai Fishermen’s Cooperative Society. During a field visit of the Director of ISLF, in November 2012, the members of the Melinchimunai Cooperative Society have requested additional assistance, such as a Fish Freezer Unit and cooking utensils to process crabs. On the basis of these requests, ISLF is planning a Phase II of this project. ISLF believes that continued assistance to the members of the Melinchimunai Fishermen’s Cooperative Society would further strengthen the livelihood of the poor fishermen in Melinchchimunai and solidify the gains made so far. The actual elements of the assistance are yet to be determined on the basis of a Project Formulation exercise to be carried out by the implementing agency in collaboration with ISLF. Providing assistance such as (a) a Fish Freezer Unit, (b) Utensils for Boiling Crabs; and (c) other items of assistance, will be evaluated, appropriately budgeted and finalized in due course.